St. Petersburg, Fla. — Transit, the officially endorsed app of the Pinellas Suncoast Transit Authority (PSTA), is today announcing Transit+, a new feature that makes it easier than ever for riders to connect to public transportation. Sometimes, transit service doesn’t go exactly where riders need it to go—leaving people stuck with slow transfers or a 40-minute walk to the bus. That’s why Transit is unveiling Transit+. Users can already plan a-to-b trips in the app using different options like transit and Coast Bike Share. Now, they’ll also see trip suggestions for certain trips that include taking an Uber or Lyft part of the way, and connecting with bus service from PSTA. 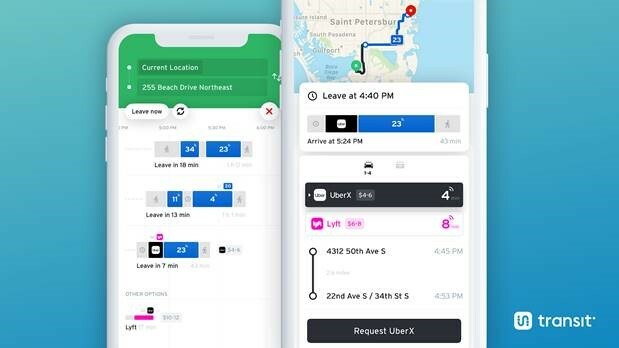 This first-of-its kind feature allows users to plan, book, and pay for a ride from either Uber or Lyft, while getting real-time updates on their PSTA bus connection—all in one app. “PSTA loves the Transit App!,” said Brad Miller, PSTA CEO. “We pride ourselves on always bringing cutting-edge transportation to our citizens and this multimodal Transit+ app launch is a gigantic step forward. As the very first public transit system in the US to launch a first- and last-mile program with Uber and Lyft, this new Transit+ feature will make riding PSTA’s system so much easier for the more than 300,000 people who have already downloaded the Transit App in Pinellas County. In the near future, Transit’s multimodal trip planner will also begin suggesting trips that combine transit with other options that users can already find in the app to take short trips, like Coast Bike Share. Transit+ is in Beta, so it’s rolling out to a limited number of markets, including Pinellas County, thanks tothe support of agencies like PSTA. Transit solves the urban commute in more than 175 cities worldwide. Users can easily navigate public transit with accurate real-time predictions, simple trip planning, and step-by-step navigation. The app also integrates other transport modes — bikeshare, scooters, carshare and ridehail — so users can determine the best way to get from A to B. The company is based in Montréal, Québec. Learn more by visiting www.transitapp.com. The Pinellas Suncoast Transit Authority is the public transit provider for Pinellas County, providing more than 13 million rides per year. PSTA operates nearly 50 bus and trolley routes with a fleet of 300 vehicles. More information is available at www.psta.net. PSTA is subject to the Florida Public Records laws. All information contained in an email sent to a PSTA employee or official, unless specifically exempt from disclosure by law, is subject to disclosure. If you do not want your email address or other information contained in your email released in response to a public records request, please do not send electronic mail to a PSTA employee or official.